Way, way back – before culinary school, before I met my chef husband, years before I thought about writing Scrumptious, I discovered cheesecake isn’t always vanilla. Honestly, I love vanilla. I always take a whiff from the bottle when I open it. Then I sigh happily and all my kids want a whiff, too. However, Maida Heatter’s Rum and Espresso Chocolate Cheesecake in her Best Dessert Book Ever changed my cheesecake life. Over the years I’ve adapted the recipe quite a bit, but it’s still deep, dark and decadent. Yes, this is the cheesecake that knocked Joe’s socks off in Scrumptious and if you give it a chance, it will knock yours off, too. Warning: this recipe, like love, isn’t simple…but it’s totally worth it. Make at least one day ahead. You will need a 9-inch springform pan and aluminum foil. 1. Pulse the crackers, nuts and sugar in a food processor until they become crumbs. Add melted butter. Pulse. Press into the bottom only of a springform pan. Bake 8 minutes at 350. 2. Remove crust from the oven and immediately scatter the chocolate chips over the hot surface. Return crust to the oven until the chips are melted, about 2 minutes. 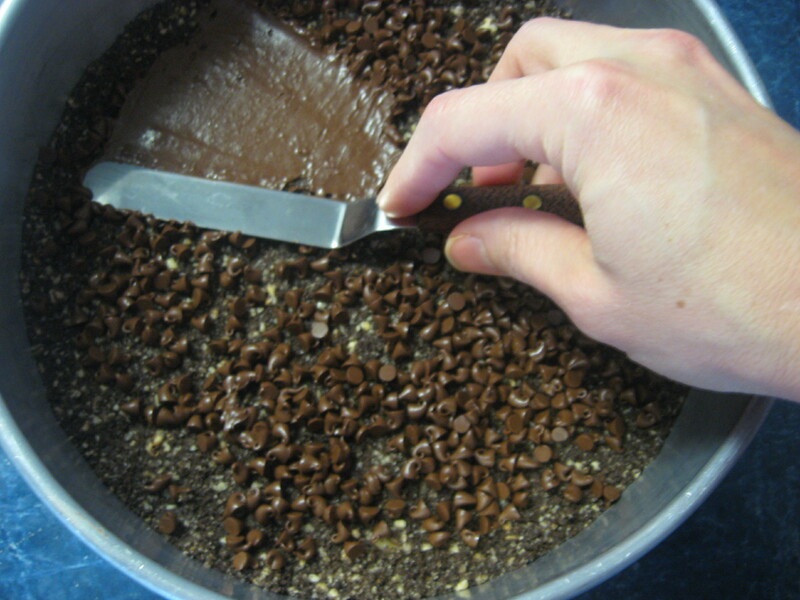 Using a 4-inch offset spatula or the back of a spoon, spread the chocolate over the crust. Tip: Keep chocolate in between the spatula and the crust at all times. Do not roll over the leading edge of chocolate while you are spreading. If you do, the crumbs will start pulling up. Be patient. 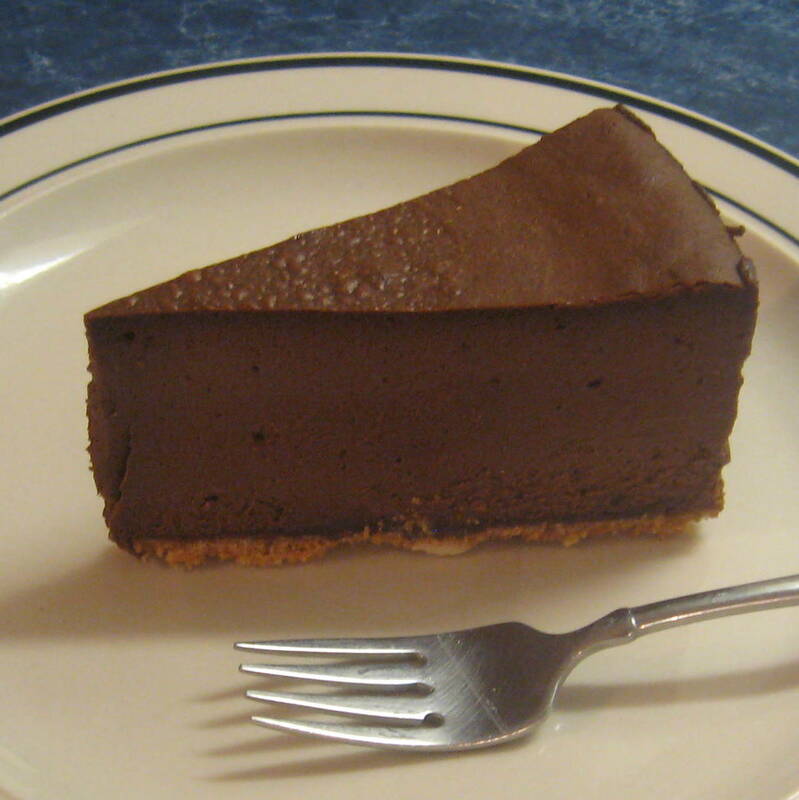 Your goal is to seal the crust with chocolate so that it doesn’t get soggy when you bake the cheesecake. Use more chocolate if you need to. When the crust is covered with melted chocolate, stick it in the freezer and make the filling. 2. Mix the cheese on medium-low speed in a mixer. Cream it completely. That usually means taking the bowl and the beater off the stand after about 4 minutes and scraping down the sides. Cheese lumps like to hide under the beater, and white lumps in chocolate cheesecake look funny. When all the lumps are gone, add the sugar. Mix. 3. Heat heavy cream in a small saucepan until it just comes to a boil. Remove from heat and whisk in espresso powder and rum. 5. Home stretch! Get your cheesecake crust out of the freezer. Now we’re going to wrap the pan in a double thickness of aluminum foil and bake it in a water bath. Fancy, right? Here’s how you do it: Pull two 2-foot lengths of aluminum foil off the roll and place them on top of each other. Place your cheesecake pan in the center of the foil. Carefully press the aluminum foil up the sides of the pan. Make sure all of the edges go straight UP or water will sneak in and soggify your crust. Now gently set the wrapped pan into a sheet pan (or another pan with sides) being careful not to rip any holes in the foil. Scrape your cheesecake batter into the springform pan. Put both pans in the oven and pour hot water into the sheet pan so that the water comes up the sides of the foil but does NOT go over the top edge of the foil. This waterbath will keep your cheesecake from cracking. 6. Bake for one hour, then turn the oven off and leave the cheesecake in the oven for another hour. Remove from the oven. Cool, then chill overnight. 7. To remove the pan, open the hinge and run a spatula around the cheesecake. Cut with a hot, dry knife. For a professional look, clean the blade with hot water between every slice. Mmmmm. Oh my, oh my! Let me know how it turns out! I hope you love it! And don’t worry about Marly, she wants you o have this cheesecake as much as I do. 🙂 Thank you for that amazing review. I’m so glad you enjoyed Scrumptious!